Colin Davidson is a contemporary artist living and working near Belfast, Northern Ireland. He began his artistic career as an urban landscape painter, but after the production of his critically acclaimed portrait of musician Duke Special, the focus quickly shifted to large-scale portraits. Some sitters are recognizable public figures and some are unknown. He paints his subjects from life in the traditional sense with a style that evokes Lucian Freud’s paintings. In terms of process these portrait paintings can be seen as a direct follow on from his urban landscape works because of their sheer scale and use of impasto, they have the ability to conjure up qualities of a landscape. “Davdison manages to catch the spirit of the sitters without destroying the very secret of their inner life by the large scale of his paintings. The lively portraits reveal the one moment fixed on the canvas as a continuing emotional experience, which the viewer is invited to share.” – Andrea Grunert :To catch the spirit of the sitter: Colin Davidson’s portraits at Belfast’s Lyric Theatre. 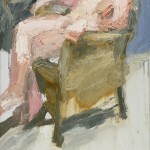 Colin Davidson has exhibited extensively in London, New York, Milan and across Ireland. He has been shown regularly at the Royal Hibernian Academy Annual Exhibition, where he has twice won awards, and has been an Academician of the Royal Ulster Academy since 2006, having won the R.U.A. Gold Medal three times and the Silver Medal twice. This entry was posted in Artist Profile and tagged AIB, Arts Council of Northern Ireland, Belfast, Boyle Arts Festival, contemporary painters, National Gallery of Ireland, National Self Portrait Collection, Naughton Gallery, Office of Public Works, Oliver Sears Gallery, RHA Exhibition, Royal Hibernian Academy, Royal Ulster Academy, Solomon Gallery, University of Ulster. Bookmark the permalink.